Thy Hand Hath Provided: Sew Sweet Fabric Confections & A Giveaway! Sew Sweet Fabric Confections & A Giveaway! Congratulations, cjs !!! Please email me your address (thyhand123@gmail.com) so I can get it Danielle so you can get your pillow. If you haven't noticed already, I am fascinated with the craftiness many of you possess. A few weeks ago, through my 100 Friends post, I discovered that some of you have Etsy shops and are extremely talented. One of these talented readers is Danielle. I recognized her sweet face from her comments and, lo and behold, when I visited her blog, I discovered that the girl is artistic with needle and thread. I enjoyed looking through her shop so much. Details: This is a 5" square darling cupboard pillow made with a woven cotton check and decorated in wool applique with embroidered accents. And, you know what else is so fun? She's designed a whole series on this summer theme in honor of YOU readers. She's unveiling this series in her shop TODAY! 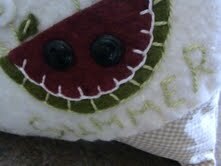 To enter to win this handcrafted pillow, all you need to do is go visit Danielle's shop. Then come back here and leave me a comment below telling me what your favorite piece is in Danielle's shop. If you can decide, that is:-). One entry per household please. If you're commenting anonymously (which is just fine), please leave an initial or two so I can identify you. I will randomly select a winner sometime on Friday. It's so nice of you to take us to visit other sites. This one was enjoyable :) I think my favorite was the daisy pillow. Her site has caught my eye before from your cute pictures on the side of your blog. I like the Springtime Candle Mat best. 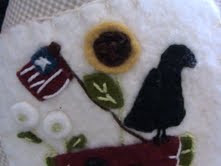 Very hard to pick, but at the moment it is between the spring crow pillow and the birdhouse/flowers pillow. I like anything with a strawberry on it. cute stuff! Danielle is a talented lady! My favorite is her strawberry candle mat. I love the sweet strawberries on it that just scream, "Summertime!" I love her Birdhouse and Flowers pillow! Too cute!!! the daisy pillows. I love flowers! The three birdhouses or the sheep and flower door hanger. Hard to pick! Very cute stuff! 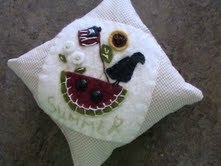 I love the daisy pillows & the strawberry candle mat & picture :) Very cute & talented pieces. DW. Cute stuff...Love the daisy things, especially the pillow. Thanks!